Some time ago I already described what sentiment analysis is, the challenges it faces and how to do it yourself using Brand24. This post is a bit more thorough follow-up going deeper into sentiment analytics — a step-by-step guide on how to do sentiment analysis using Brand24. Let’s get to it without a further ado. First and foremost, sentiment analysis finds application in brand monitoring and management. Sentiment analysis tools allow businesses to check how their audience, customers, experts, influencers, or the news talk about them online — how many positive and negative comments, opinions, discussions and other content they generate — it’s a fertile source of business intelligence. To monitor your brand across the Internet in real time, you can try Brand24 for absolutely free (for two weeks). Believe it or not but it’s one of the most (if not the most) affordable web and social media monitoring tool out there! Once you create your free trial account, go to Mentions tab — this is where you start with sentiment analysis. All online mentions of your keywords arrive to the Mentions tab in real time. 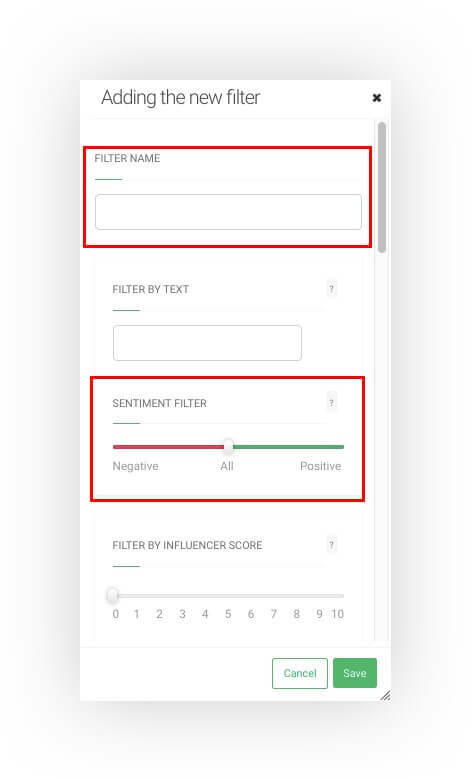 Sentiment analysis algorithm in Brand24 automatically analyzes text, identifies negative and positive words, and tags them accordingly. You can sort mentions according to sentiment, for example, to see only positive comments. To do so, go to the right of the panel where the SENTIMENT FILTER is. By default, Brand24 shows all kinds of mentions: positive, negative and unidentified ones. To display either it these, move the slider. The moment you choose sentiment, Brand24 refreshes and displays mentions of chosen sentiment. Remember that you can also adjust the time span. There you have your mentions ready to browse! These are two different places in Brand24 – both of them, however, present data. Summary tab is a good place to see at the beginning of the day. 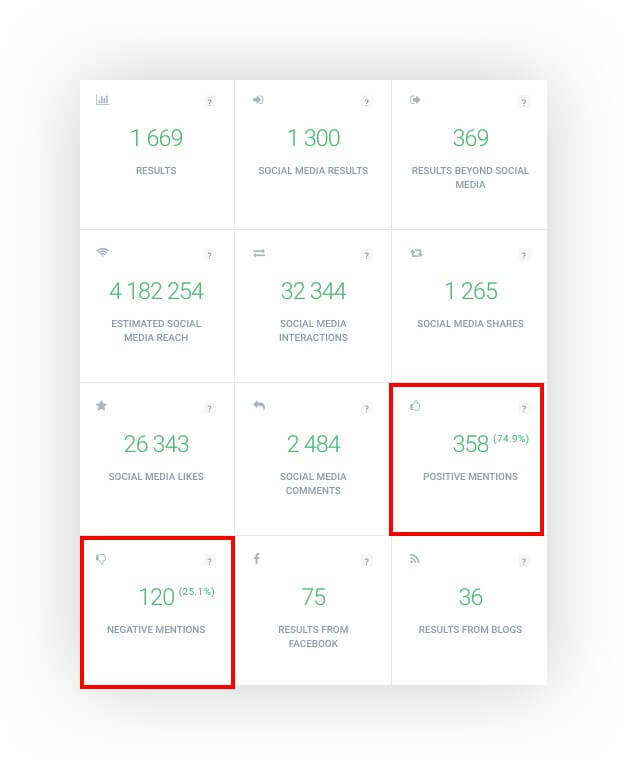 It’s daily and quick sum-up of what changed in the Internet and social media performance of keywords you monitor over specific period of time – this includes sentiment monitoring. This module shows comparison to the same period in the past, so remember to set the dates. 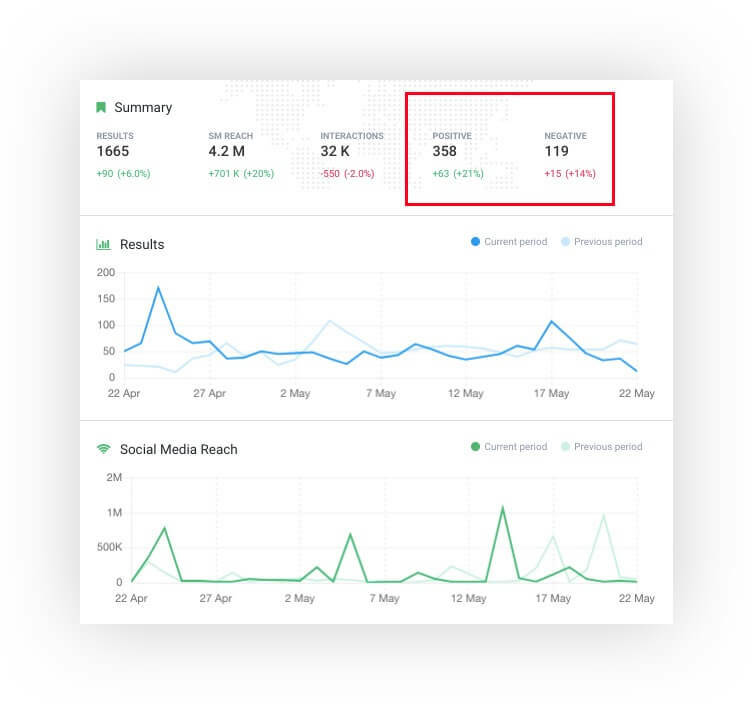 Analysis tab offer thorough insights into the data collected by Brand24 and it also shows how many negative and positive mentions about your keywords appeared online. A must-read for PR specialists! 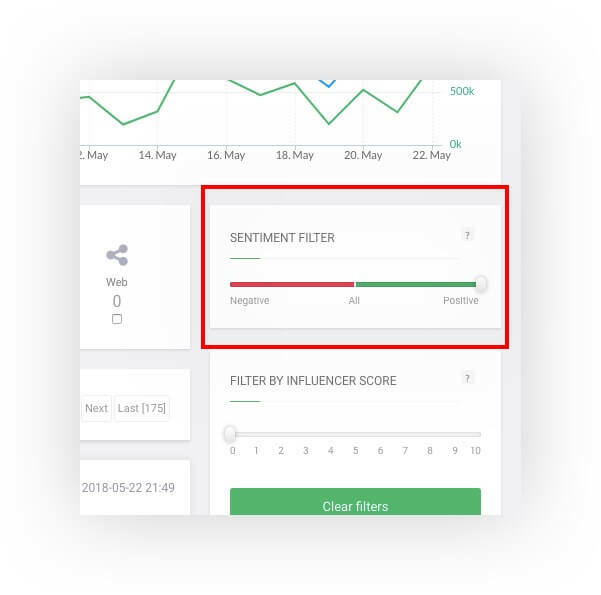 Sentiment analysis tools like Brand24 can be also used for customer sentiment analytics – in other words, tools like Brand24 identify unhappy customers in real time. Bad news travels fast but bad online news travels even faster! One unhappy customer expressing one’s anger in social media can start a snowball effect and eventually result in PR crisis. Thanks to real-time customer sentiment analytics, you can quickly spot and respond to any such a threat. 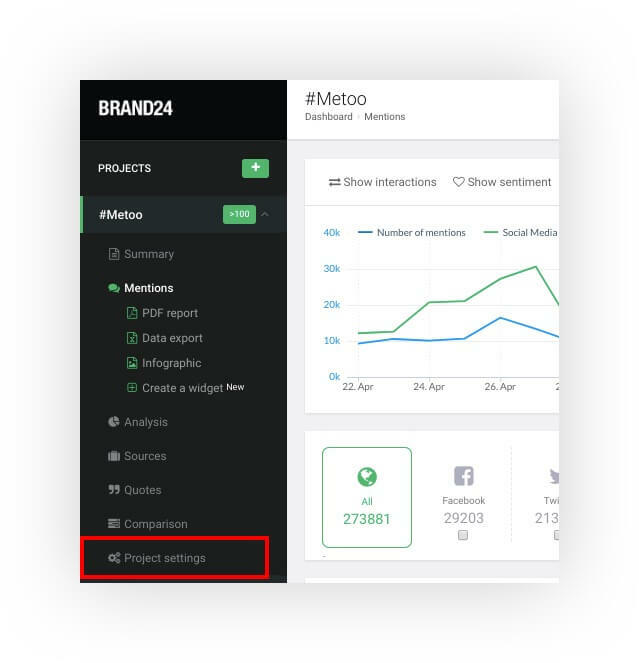 Brand24 provides a couple of solutions to keep you on top of your mentions. Email notifications are a sure-fire way to keep you up to date with the most recent negative mentions. Here’s how to set them up inside Brand24. While inside your project, go to Project settings in the menu on the left. In there, go to the Notifications tab and click Add more notifications. Then, switch SENTIMENT FILTER to negative and click Save. There you have it – from now on you’ll be receiving email notifications the moment a negative mention about your business appears online! There’s another option, too. If you use Slack communicator and want to be really close to what customers say about you online, use the Slack integration. This solution allows receiving mentions directly into a dedicated Slack channel in real time. UBER used Brand24 to track the impact of their app redesign and Foszer Sawicki, a video production studio, analyzed customer sentiment after rebranding. We all have competitors and compare ourselves against them. 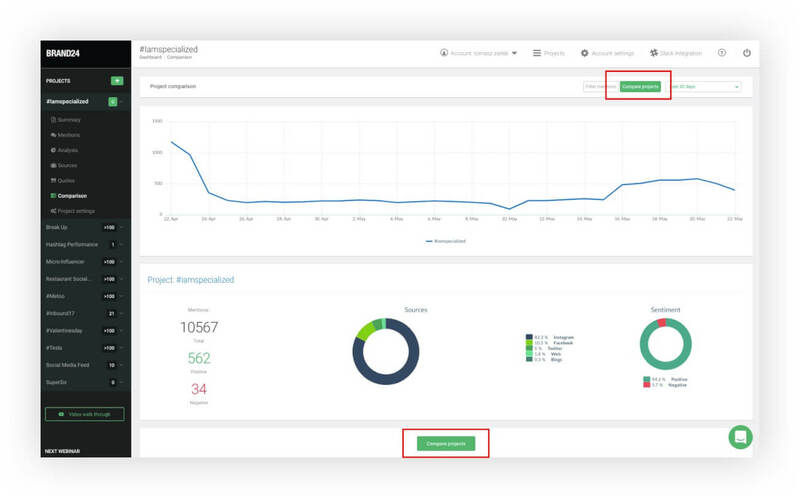 In Brand24, you can make a comparison of sentiment of your and your competitor’s brands – to simply see how your positive and negative mentions stack up agains theirs. 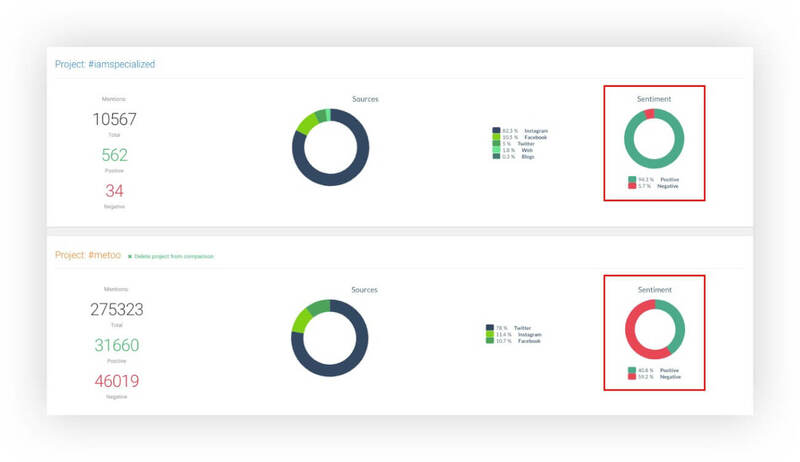 Inside, click Compare projects and choose a project monitoring your competitor for a comparison. 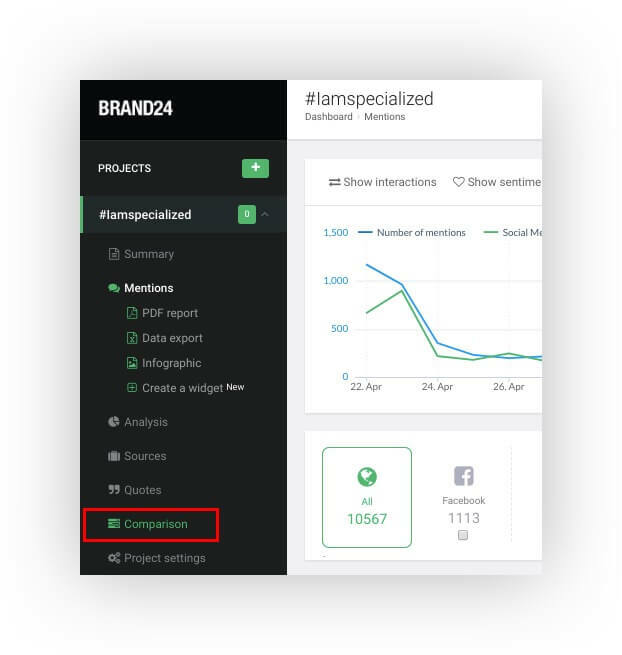 Then, Brand24 returns the comparison of two projects – one monitoring your company and the other monitoring your competitor. A part of it shows sentiment analysis. Voilà! Now you can compare your brand sentiment analysis to your competitors.